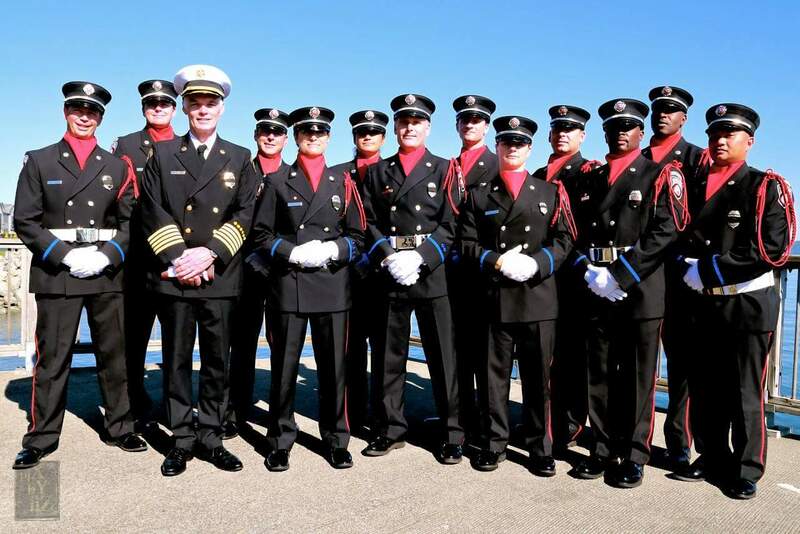 Tacoma Firefighters raise $14,000 to brighten the holidays for 150 local families. 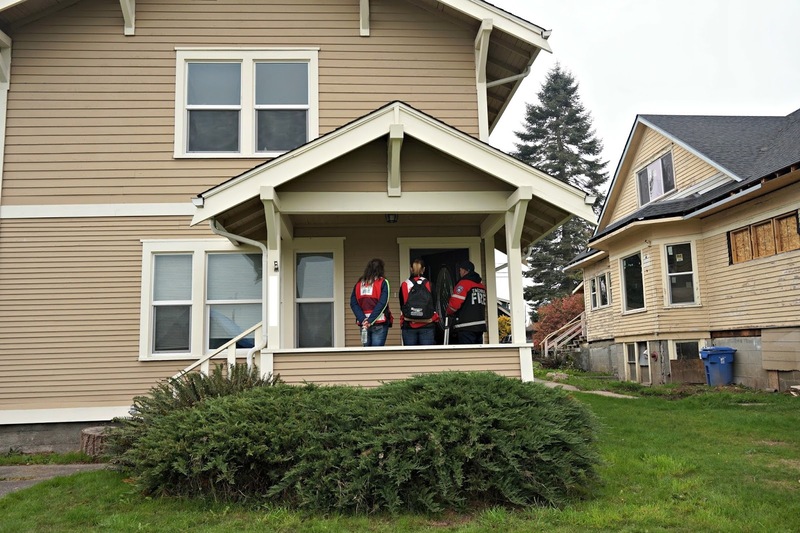 For the past 27 years, Tacoma Firefighters have brought holiday cheer to the lives of thousands of Tacoma children and their families with deliveries of food, clothing and gifts just before Christmas. 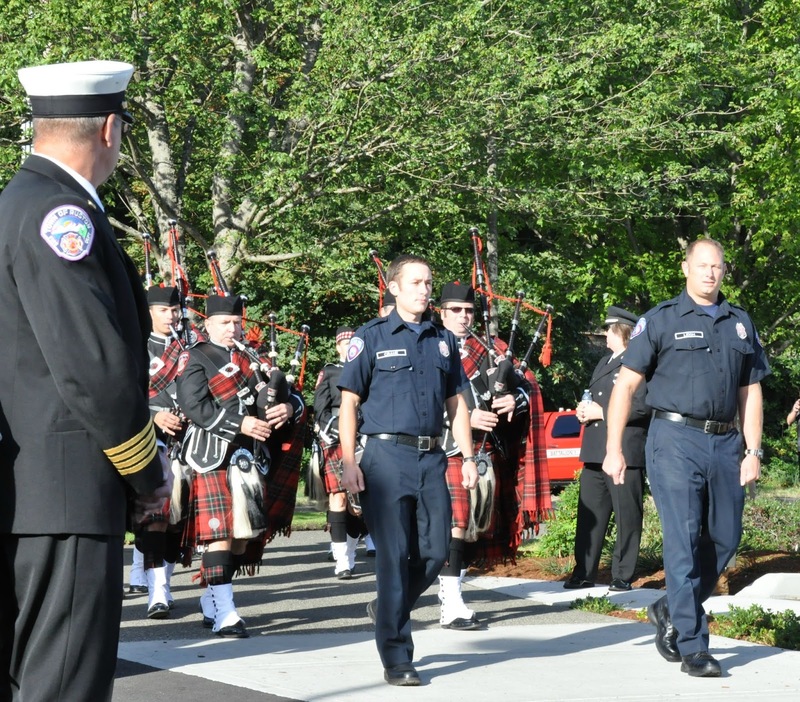 This year, firefighters have raised over $14,000 dollars to help more than 150 children and families in need. “It’s always a great honor to help bring a little happiness to those in need during the holidays,” said project co-founder Captain Jim Lee. 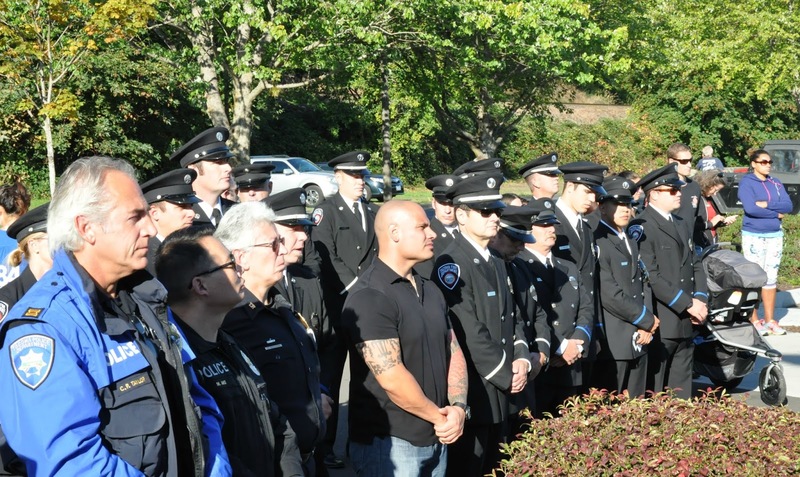 "We are also very grateful for the generous support from active and retired Tacoma Firefighters throughout the past 27 years. Without their commitment to the community and this program, none of this would have been possible" said Lee. 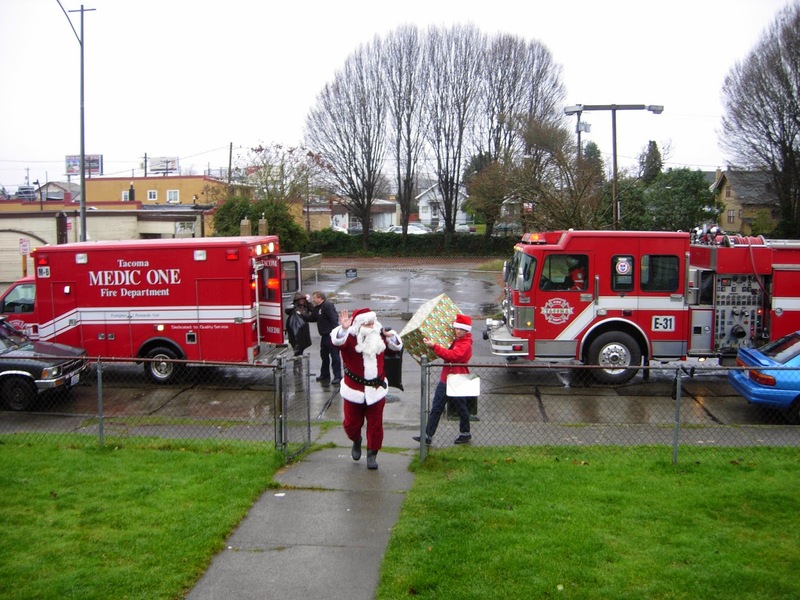 Special deliveries from a fire engine, medic unit and Santa Claus are scheduled for Dec. 19 and Dec. 21. 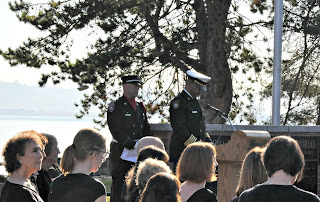 This year’s recipients were identified through the Tacoma School District Head Start Program, and YWCA Women’s Shelter. 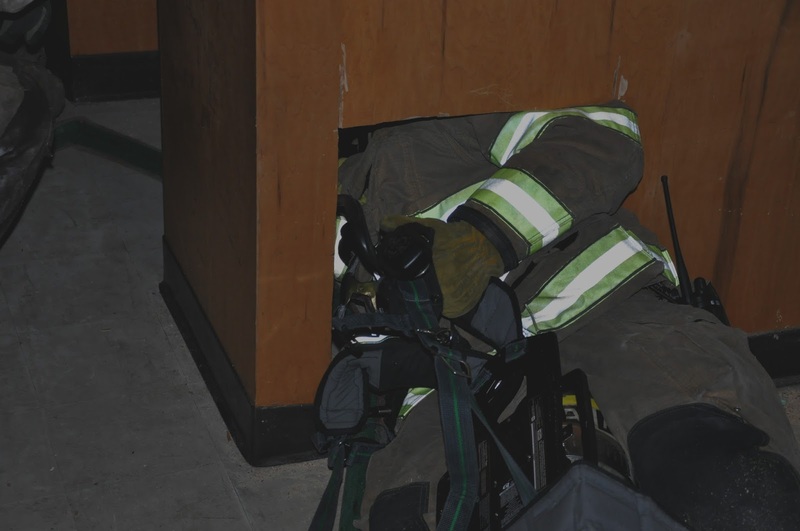 Throughout the week, a select group of TFD personnel have been hard at work practicing firefighter survival skills. 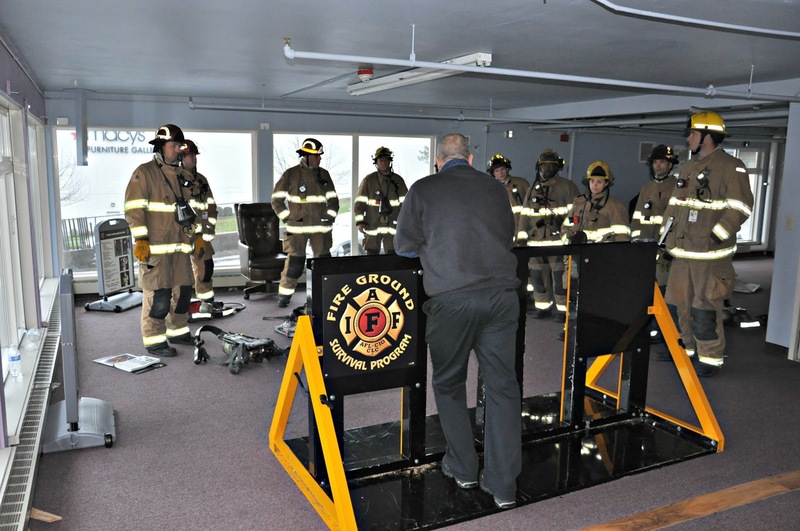 A train-the-trainer model, the Fire Ground Survival course sponsored by the International Association of Firefighters is a comprehensive curriculum developed using near misses, close calls, and firefighter fatalities to address the critical elements of fire ground survival. 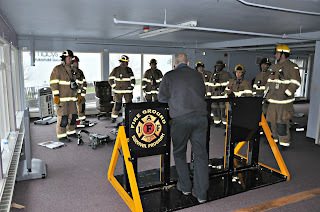 While the following photos illustrate a skills practice course, check out the video to get a better sense of the degree of difficulty with zero visibility - intense! 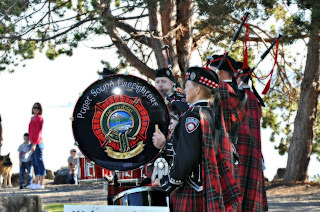 Fall back on sound advice – time to change your clock and check your smoke alarm batteries! 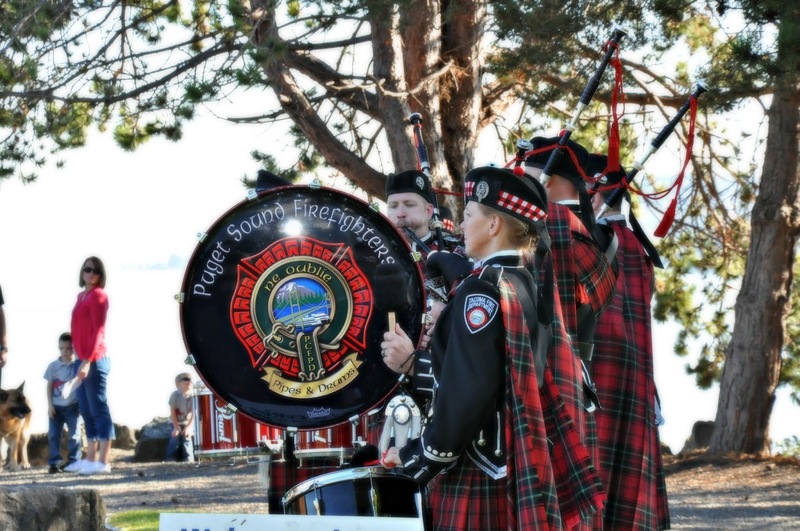 Tacoma Fire Department urges you to check your smoke alarm batteries when you set your clocks back for Daylight Savings time this weekend. 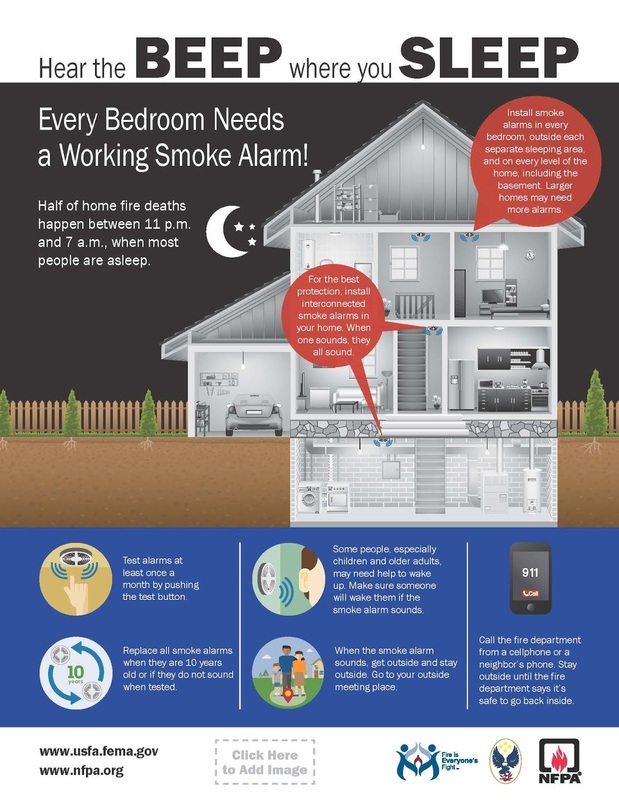 For best protection, it is recommended that you install alarms utilizing both ionization and photoelectric technology and that have long life 10 year lithium ion batteries. 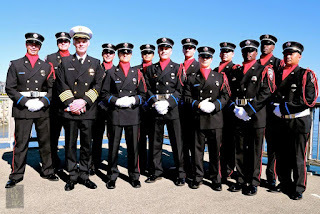 Visit the United States FireAdministration and National Fire Protection Association for additional information regarding smoke alarm types, installation, maintenance and safety. 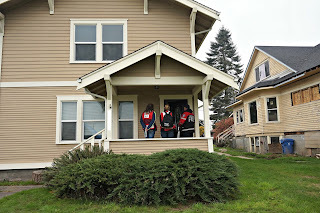 Smoke alarm installation event with the Red Cross was a great success! On Saturday October 24, twelve Tacoma Firefighters and twenty volunteers from the Mount Rainier Chapter of the American Red Cross teamed up to install smoke alarms and distribute emergency management information to residents and businesses in Tacoma’s Lincoln district. 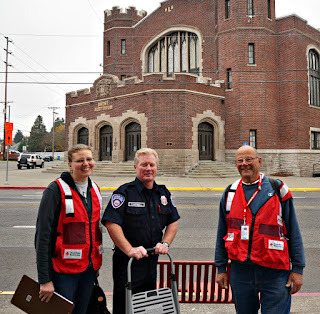 In all, 153 smoke alarms were installed in 65 homes, and 300 emergency management packets were given to businesses and residents during the outreach event. 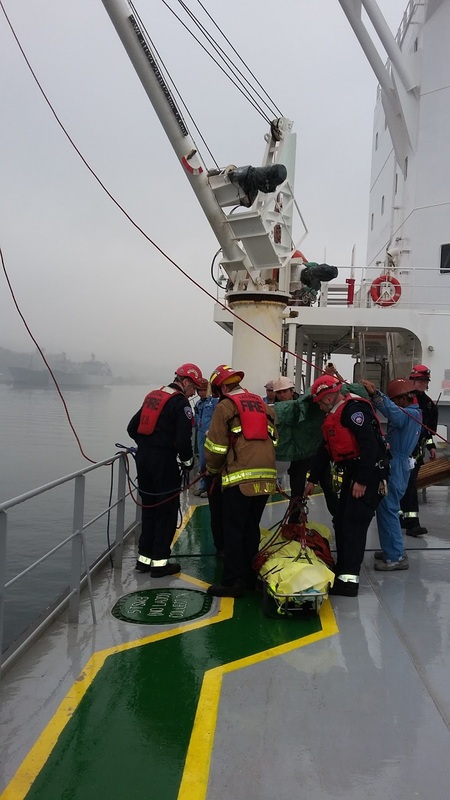 At 10:13 am Sunday October 18, TFD responded to a report of a person needing medical care aboard a large cargo ship anchored in Commencement Bay. 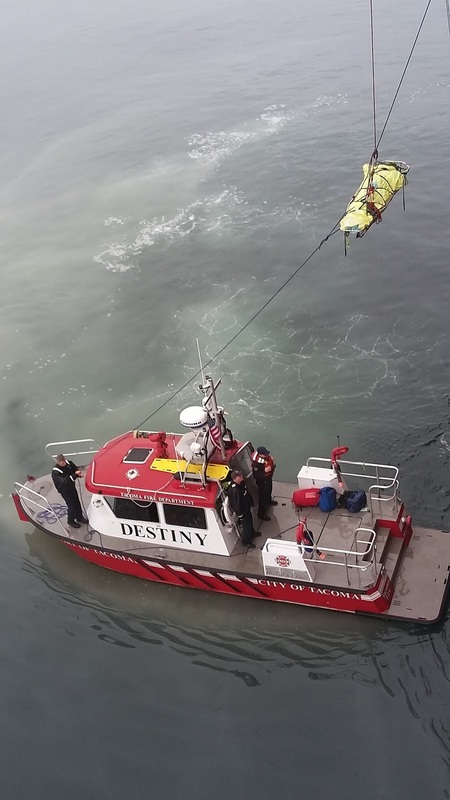 Operationally, incident command determined that the safest method to move the patient was to lower them in a stokes stretcher to the fireboat Destiny waiting below. Firefighters used an on-board crane as fixed directional point and set a two rope system with a tag line to safely lower the stretcher approximately 60 feet. The patient was then transported via boat and ambulance to a local area hospital. 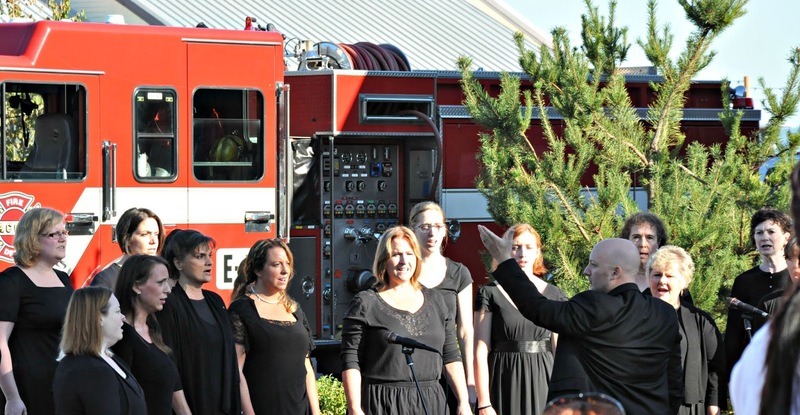 October 4-10 is national Fire Prevention Week! October 4-10 is national Fire Prevention Week. This years theme: "Hear the BEEP where you SLEEP." 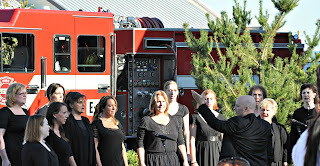 Help us sound the alarm that working smoke alarms save lives! There is still time to sign up! CPR Sunday is October 11. Just a reminder that CPR Sunday is October 11. Join us and learn how to save a life! 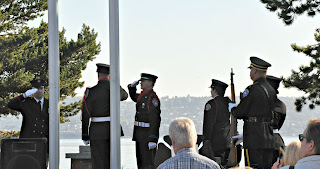 On Friday September 11, 2015, the Tacoma Fire Department will honor the heroes and victims of 9/11 at a public remembrance ceremony beginning at 9:00 a.m. at the Firefighter’s Memorial, 3301 Ruston Way. This year marks the 14th anniversary of this tragic event. The program will include speeches by Mayor Marilyn Strickland, Tacoma Fire Deputy Chief Toryono Green and Lieutenant Ray McCormack of FDNY. 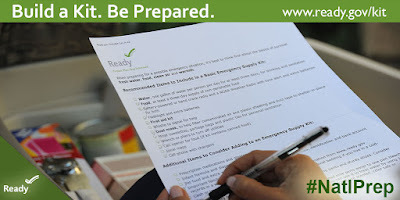 Each week will focus on a different type of emergency and how you and your family can prepare. Don’t forget to be counted by adding your preparedness activity to the America’s PrepareAthon! website www.ready.gov/prepare. For more details about National Preparedness Month, visit: www.ready.gov/september. At 10:32 Firefighters responded to a report of two locomotive engines making contact in the 2300 block of Cleveland Way. Crews arrived to find one engine off the tracks, and fuel spilling from the diesel tanks on both engines that had been compromised in the collision. 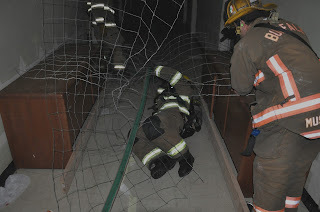 Crews worked quickly to set up containment to capture as much diesel (est. 3,000 gallons) as possible and assessed and transported one patient from the accident with minor injuries. A third party environmental company will work throughout the day to remove the fuel and contaminated soil at the site. 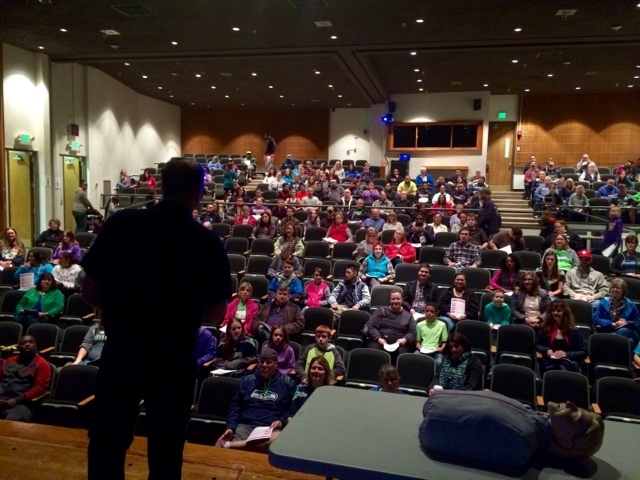 CPR Sunday will be held Oct. 11, at Foss High School, 2112 S. Tyler St. in Tacoma. In order to secure your preferred class time please register at CPR Sunday. 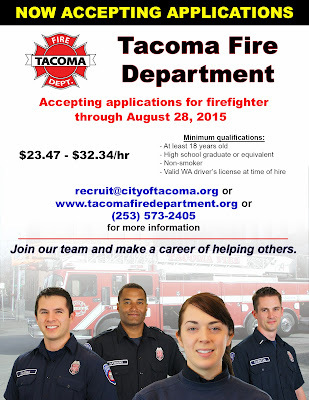 Reminder - firefighter application period ends two weeks from today! 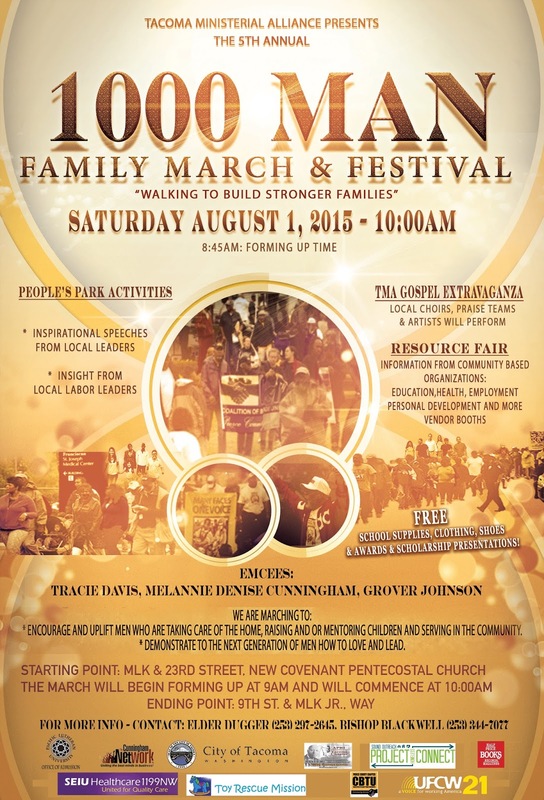 Update: 8:00 AM - August 14. 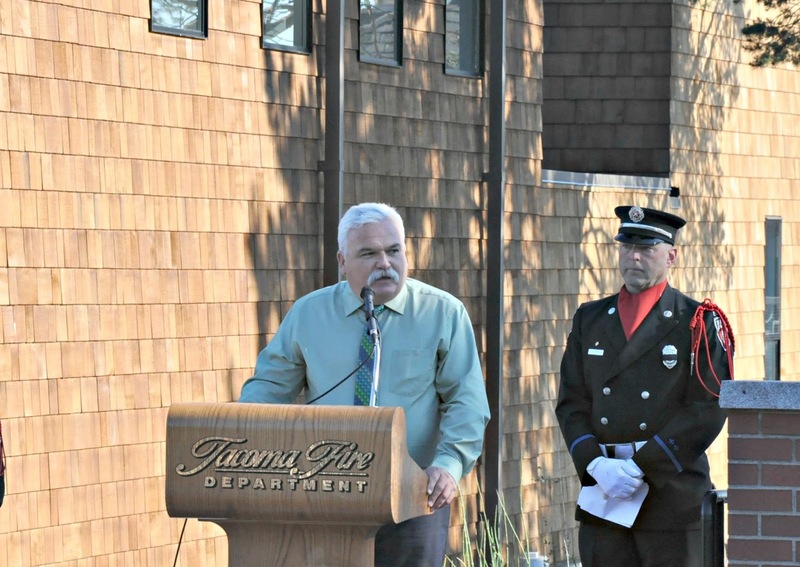 As of Friday morning, the fire in the park is 100% contained. 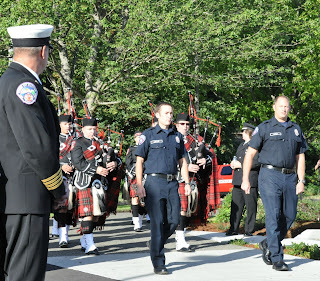 Firefighters from TFD and Central Pierce Fire and Rescue will be working hot spots throughout the day. No evacuations have taken place and no houses are currently threatened. At approximately 7:00 PM August 12, firefighters responded to a reported brush fire in the south central portion of Swan Creek Park. 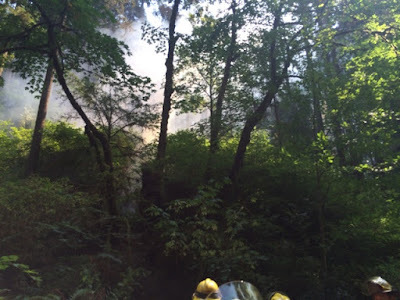 First arriving companies from Central Pierce Fire and Rescue (CPFR) found a large fire burning in the under brush and trees. Crews from CPFR and TFD returned to the scene today to battle the approximately 5 acre blaze that was firmly entrenched in a steep ravine adjacent to the creek bed. Preliminary indications are that the fire was ignited during one of yesterday afternoons lightning strikes. 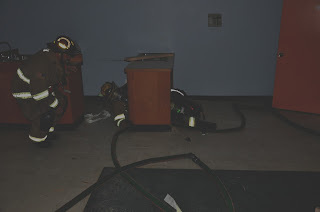 Operationally, fire lines have been created with a bulldozer where accessible and firefighters have carried in wildland hose lines and tools to attack the fire. 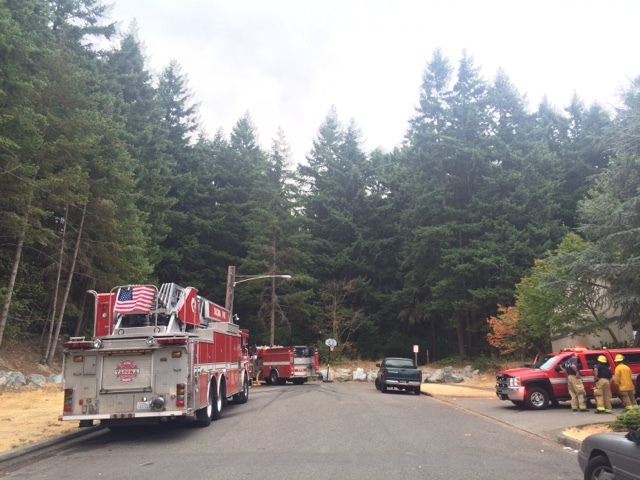 There are currently no evacuations or structures threatened, and no injuries to report. Smoke may be visible for a few days before the fire is fully extinguished. 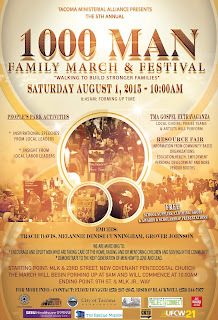 Save the date: join us for the 1000 Man Family March and Festival on Saturday August 1, 2015. Firefighters responded to a reported scrap metal fire at a recycling business located at 1902 Marine View Drive at approximately 3:30 this afternoon. 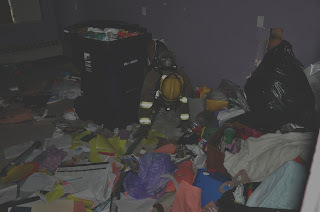 The first arriving companies found a fire that had ignited in a large pile of scrap material. Operationally, crews established master streams to contain the fire and plant personnel used a grappling hook machine to pull the pile apart to get at the core of the fire to extinguish it. 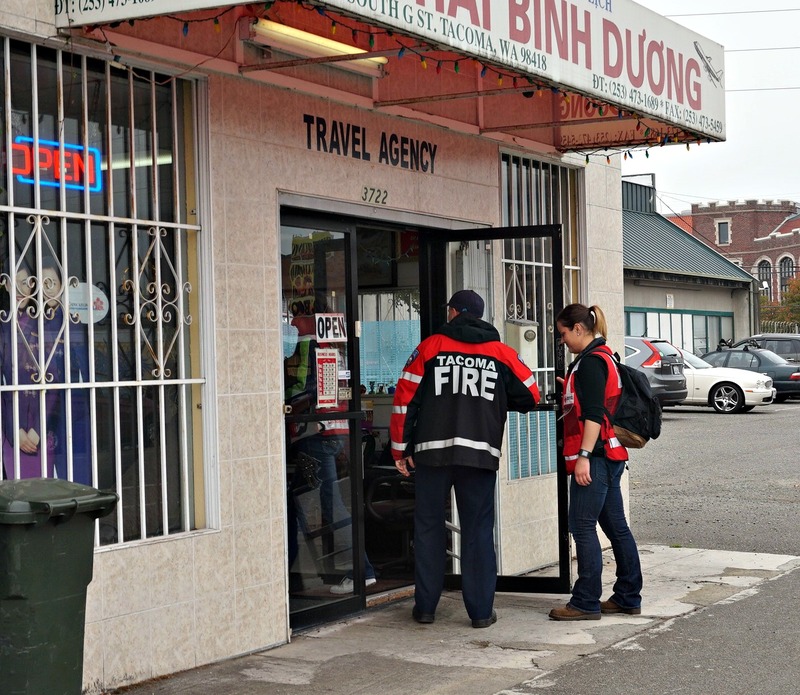 The fire took over two-hours to bring under control and there were no injuries to report. 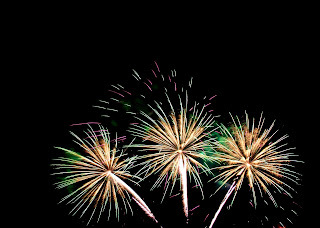 TFD encourages you and your family to attend a public fireworks display to enjoy fireworks. 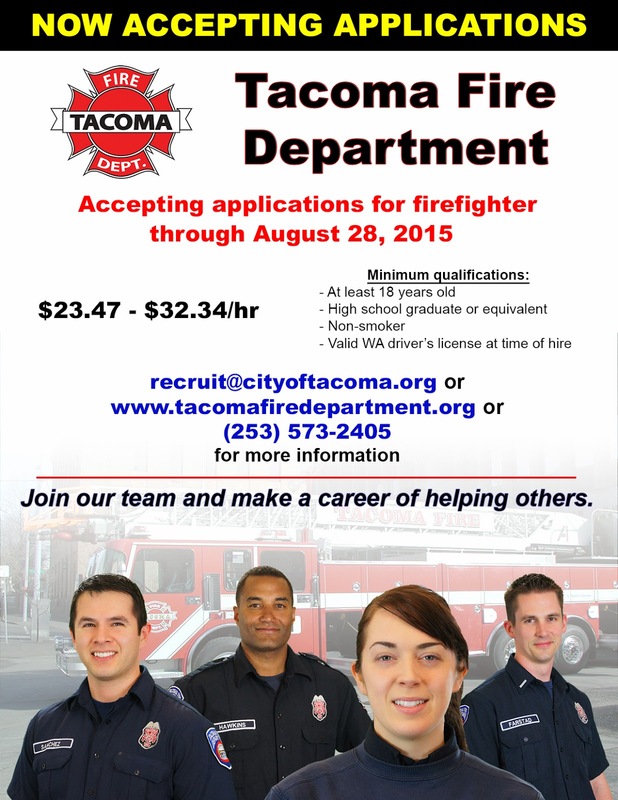 All Fireworks are illegal in the City of Tacoma. Violators are subject to a $257 dollar fine and the confiscation of their fireworks. 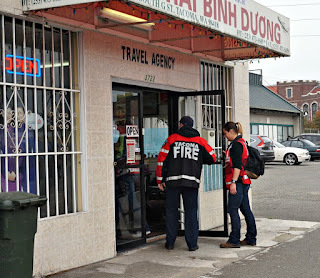 Please call (253) 798-4722 to report suspected violations. Tacoma Police Department will respond to fireworks related calls as units become available.